I’ve watched one MLB All-Star Game in my life. Apparently, it was the best ever, or at least one would think judging by all the press it has received in the weeks leading up to this year’s game, the first played in Anaheim since the day my 10-year-old jaw dropped back in 1989. I was just so damn proud. 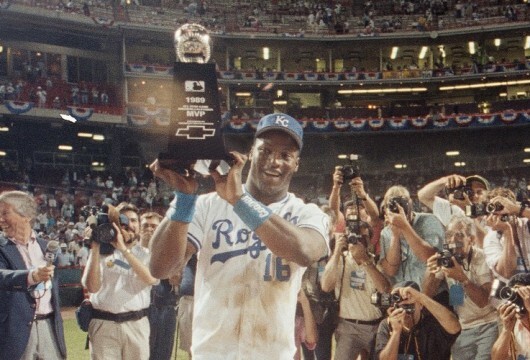 Of all the and-then-there-was-the-times comprising the lore of Bo the Professional, his lead-off home run in that year’s All-Star Game is, if not the most impressive, than arguably the most (distinctly) memorable (neck and neck with the ruination of Bosworth). It came at the apex of his monopoly on professional sports, and helped seal his reputation as the sports icon of his too-short generation. Nike’s “Bo Knows” campaign? It actually started that night, not much later into the broadcast (the “Bo Knows What?” sign seen waving in the stands after the hit was either a clairvoyant fan or a Nike employee). He was that year’s top vote-getter. He was chosen to lead off for the American League. Who’s calling the game? (I just blacked out from nostalgia, I’m back). 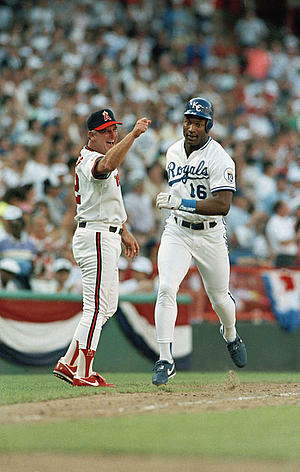 "Mr. Gorbachev, tear down this wall... or Bo Jackson will kill you." He’s in the locker room after the game. He’s got the MVP trophy. He’s just become only the second player to hit a home run and steal a base (he beat out a double play throw to first, and then stole second) in the All-Star game (Willie Mays was the other). And also listen. Orange County Register columnist Mark Whicker dedicated an entire column just to the sound of the hit. The 1989 game, in the old football-damaged configuration of Anaheim Stadium, will be remembered by its players for a sound that still reverberates. … He took a mighty swat and people came to attention, as if they’d heard gunshots. “I still remember that sound,” said Mike Scioscia, a Dodger All-Star then. … There was a canopy in center-field then. Jackson’s home run landed in the center of it. It was announced to have traveled at 448 feet. … Today’s players have their own songs, blaring through the loudspeakers. Bo had his own sounds. “If he liked you he was your best friend, but if he didn’t, he didn’t really have any time for you,” Gubicza said. “You didn’t mess with him. When he first came into the clubhouse we threw a football at him and then tackled him. Suddenly he’s got me in one hand and Bret Saberhagen in the other and he’s lifting us up in the air. We’re thinking, maybe that’s the last time we do that. The pregame buzz was deafening over the choice to lead off with the Royals’ Jackson, who showed up in Anaheim with 21 homers and 23 steals a few months after having rushed for 580 yards for the Raiders. But, before the game, a little fun. Workout Day had become an attraction, climaxed by a skills competition among All-Stars showing off arms, legs and bat-control. Barry Larkin, the Reds’ 25-year-old shortstop leading the Majors with a .342 average at the break, turned to make a throw as the middle-man on the NL relays team: “I remember hearing something pop like a gun-shot or firecracker when I threw the baseball in the relay race. After a few more throws, I felt swelling and I eventually tore my ulnar collateral ligament. I couldn’t throw the ball more than 15 feet. The Show must go on. Soon after Doc Severinsen and his Tonight Show Band performed the last non-vocal rendition of the national anthem prior to an All-Star Game, the NL jumped out to a 2-0 lead on first-inning RBI singles by Kevin Mitchell and Howard Johnson off Dave Stewart. The bottom of the first brought Rick Reuschel to the mound and Bo Jackson to the plate. Bo looked at one pitch from National League starter Rick Reuschel. He swung at the next. By the time the baseball prepared for re-entry, its shadow could be seen some 448 feet from home plate. The ball didn’t just clear the center-field fence. It landed halfway up the green tarpaulin leading to Tunnel 70, which serves as a viewing backdrop for hitters at Anaheim Stadium. Once again, Bo had gone where few ever thought to tread. His monstrous blast, the first leadoff home run in an All-Star game since 1977, was immediately followed by a home run from Wade Boggs and, just that fast, the American Leaguers had tied the game and were on their way to a 5-3 victory in the 60th All-Star game. The home run was estimated at 448 feet, but that’s only because Jackson hit it nearly as high as he did far. Official records aren’t kept, but that may have been the longest pop fly in Anaheim Stadium history. It took off like one, too, drawing such a gasp from the crowd of 64,036 that Texas’ Nolan Ryan stopped warming up in the AL bullpen and hunted down a TV monitor. Jackson’s was the first leadoff home run in All-Star competition since Cincinnati’s Joe Morgan did it 12 years ago. It also, apparently, was inspirational because Boggs, baseball’s pre-eminent spray hitter, followed him six pitches later with a rare home run, this one traveling a mortal-sized distance of 398 feet. The back-to-back home runs were the first since Dodgers Steve Garvey and Jimmy Wynn turned the feat in the 1975 All-Star game. Firsts, firsts. Before the night was through, Bo would lead the world in firsts. With his next at-bat, coming in the second inning, Jackson hit a routine double-play grounder to shortstop but outran pivot man Ryne Sandberg’s throw to first. In so doing, Jackson prolonged the inning and earned a run batted in, with Ruben Sierra scoring from third on the play. Then Jackson stole second base, becoming the first All-Star to hit a home run and steal a base in the same game since a fellow named Willie Mays did it in 1962. Jackson added a single and a strikeout in his last two at-bats before turning left field over to Boston’s Mike Greenwell in the top of the seventh. Not a bad six innings’ work: four at-bats, two hits, two runs batted in, a stolen base and a home run that had the best players in the sport raving and running out of superlatives. As a runaway choice, Jackson was voted the game’s most valuable player. Tommy Lasorda told me I was pitching second, so I was trying to get guys to take me to the bullpen before the start of the game. They all wanted to watch the first inning in the dugout. They said, ‘We’ll just take you back after the top of the first.’ Well, Rick Reuschel is pitching and it doesn’t look like he’s going to get out of the top of the first. He gives up a home run, a home run and a single, and it’s like, ‘Uh oh.’ So Lasorda gets on the phone and says ‘Hey, get Smoltzie up,’ and I’m right there. I’m 10 feet from him and I’m panicking. I get that white chill feeling. And he goes ‘Oh kid, how long is it going to take you to get ready? We need you to get down there fast.’ So I had to go in the hallway in my spikes on the cement. (After) like eight, nine pitches, I was in my first All-Star game. If there was any chance to get nervous it was gone, because it was like panic. So it’s first and third, one out and I get a routine double play Bo Jackson hit, I (should be) out of the inning and he beat it out, and I lost the game. … Nolan Ryan (became) the oldest pitcher ever to get the win; I was the youngest pitcher ever to get the loss. Return to Anaheim. 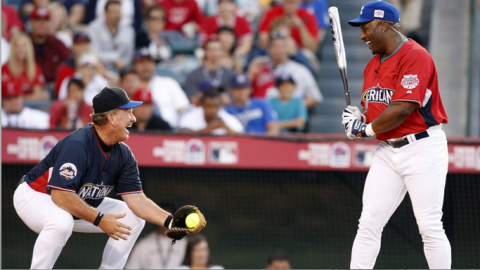 Bo dream-teamed it with the likes of Dave Winfield, Andy Richter, MC Hammer, Rickey Henderson, Mario Lopez and Jon Hamm (it could have been with Jenna Fischer had he played last year) in yesterday’s Taco Bell All-Star Legends and Celebrity Softball Game, held annually just before the big game. Marisa Miller is safe at first. For now. Bo Jackson showers in vodka and feeds his kids shrimp scampi. Anyone know who Bo beats to the ball in that soccer clip? Is there another site out there that has video of Bo’s HR? Youtube took it down? No idea who Bo beat to the ball, Ben… maybe Pele. And good grief, can’t believe they took down both of those videos. Was today’s ’89 Hit meme powerful enough for a video only viewed 500 times to draw, in less than 24 hours, the fatal wrath of the trademarkers? Apparently. I’m thinking of leaving them up, black and blank, as an ambiguous testament to the man’s popularity. I checked Vimeo, got nothing. I’m sure something will pop up soon. Nature finds a way. According to Google Trends, the fourth most popular search term right now is “home run derby”. “bo jackson” is the third most popular. Bo is bigger than the acts he opens for.